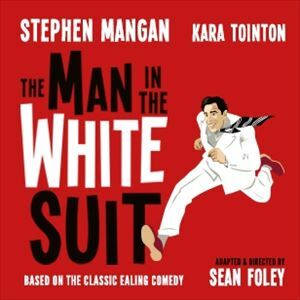 Stephen Mangan and Kara Tointon return to the West End to star in the world premiere of the classic Ealing comedy THE MAN IN THE WHITE SUIT, adapted and directed by Sean Foley. When Sidney Stratton (Stephen Mangan), invents a fabric that never gets dirty and never wears out, manufacturers and trades unions are terrified by the threat it poses to their industry and their jobs. Only Daphne (Kara Tointon) the mill owner's daughter, shows Sidney any support as the bosses and workers chase the Man in the White Suit determined to destroy them both. This fast-moving comedy reunites Stephen Mangan and Sean Foley who also created the Olivier award-winning production Jeeves and Wooster.